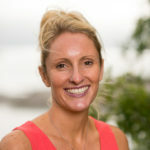 Whether you are a business professional, world leader, athlete, or simply a tourist, travelling can make you suffer from insomnia, fatigue, drowsiness, muscle aches or weakness, irritability, impaired cognition and even digestive problems … and at the same time, you are expected to perform at the top of your game? Potentially disastrous! Luckily there are ways you can lessen the impact of jet lag and tools you can use help you to thrive rather than survive. Human bodies work well within rhythm and repetition and we all find comfort in a daily routine that we know and love. These daily patterns of waking, eating, working, resting and sleeping are not random but are driven by a 24-hour clock in your brain. This is known as the circadian system. Circadian rhythms are generated automatically in the brain without any outside time cues, controlling the timing of many aspects of your behaviour, physiology and metabolism. In fact, they evolved to help us all anticipate changes in the environment so that we can be ready to sleep, wake and eat at the right time. The rhythms generated by the brain are not exactly 24 hours, however, and on average, they are slightly longer than 24 hours. These rhythms need to be reset to 24 hours each and every day and the major time cue that does this resetting is the 24-hour light-dark cycle. This happens when light is detected by the eyes which then send signals to your brain to tell it whether it’s night or day, which in turn regulates your circadian cycles. The difficulty arises when you travel to a new time zone as the daily light-dark exposure has changed too quickly for your circadian clock to adapt to immediately. You are then thrown from this natural cycle, causing a confusion between your internal body clock and the local time. Your exposure to light has changed, your meal times have changed, and your sleep time has changed. The brain becomes confused, and it is this mismatch between the internal and external time which triggers symptoms of jet lag. Depending on age, physical fitness, and genetics, jet lag affects people differently. Whoever you are, a night owl, or an early bird, young or old, you cannot escape from jet lag. The good news is that with a little help you can recover from jet lag quicker! Your preparation before travelling, what you do during the journey, and what you do on arrival will have an impact. 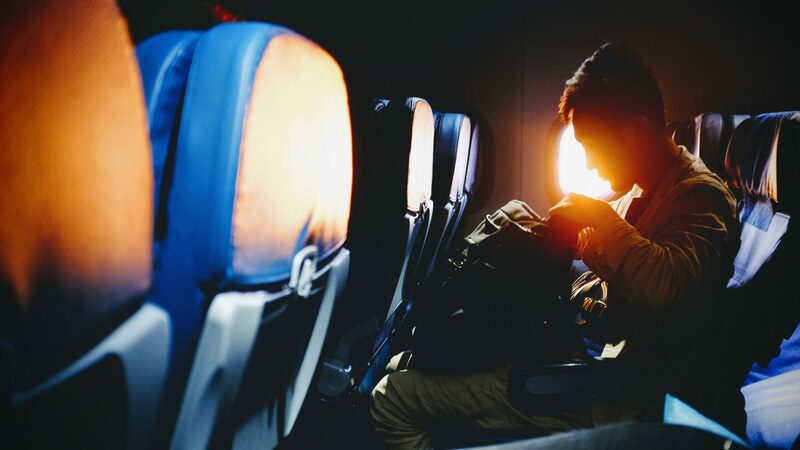 Here are some clear actions to help lessen the impact that jet lag has on your trip. How to reduce jet lag before your journey? Ideally, a personalised plan is best, as the direction of your journey, the timing and your personal habits will have an effect. The new Timeshifter app – created in collaboration with Hintsa’s Science Board Member, Dr Steven Lockley, an Associate Professor of Medicine and expert in circadian disorders at Harvard Medical School – is a great tool for personalised jet lag plans. It provides a unique plan for your travel and your first journey plan is even free! Furthermore, there is some general guidance that may help your jet lag. Understanding that light is one of the most influential factors in setting your circadian rhythm, you can help prepare your body clock for the upcoming change by sleeping a little bit closer to the time zone of your destination. If you’re going east, go to bed and get up an hour earlier for a few days before you travel, if you are going west, go to bed, and wake up a little later than usual. Do all you can to have a great sleep the night before you travel. Starting from a tired point is certainly not going to help jet lag. Therefore, be prepared for your trip by organizing your responsibilities and by packing early so you do not leave in a frazzled state having been up half the night. What to do during your journey? Firstly, when you get on the plane, set your watch to the time of your destination to help align yourself psychologically with the new time zone. If you know you are arriving in the afternoon or evening, try to stay awake on the plane so that you’re ready for bedtime upon arrival. If you arrive in the morning local time, try to get a good sleep on the plane, or nap as soon as you can after landing. If you can stretch out and put your feet up, do so! Get as good a sleep as possible. Improve your sleep quality on the plane by having comfortable clothing, an eye mask, earplugs or noise-cancelling headphones. You can also consider bringing some of your own healthy snacks with you so that you don’t have to wake up for airplane meals that are often served while you want to sleep. However, even if you sleep well on the journey, you are still susceptible to suffering jet lag due to the cause being circadian misalignment and not simply due to loss of sleep. Remember to stay hydrated by drinking plenty of water and avoiding alcohol. Aim to both sleep and eat on the flight based on the destination time zone. When you are not sleeping during the flight, remember to walk around and stretch. What to do on arrival at your destination? As mentioned above, one of the most important factors that helps set your internal body clock is exposure to light. Fortunately, you can try to control your exposure to light. Correctly timing your light exposure can speed up the resynchronization of your body clock towards the new time zone. However, pay attention here as this gets a little complicated. Light will shift the clock forward (advance) or backward (delay) depending on the time of day of exposure. Light from six o’clock in the evening to six o’clock in the morning (18:00 – 06:00 hours) will cause a delay; light from six in the morning until six o’clock in the evening (06:00 – 18:00 hours) will cause an advance. Please note that the times here are internal body clock times, which may not reflect local times. And, the opposite is the case for darkness or light avoidance. If you avoid light from six in the evening through to six in the morning, this will cause an advance. Furthermore, if you avoid light from six in the morning until six in the evening, this will cause a delay. In the figure below you can find one example of when to see light and when to avoid it for a particular Boston to London journey. Naturally, for other destinations and timings, the recommendations would be different. 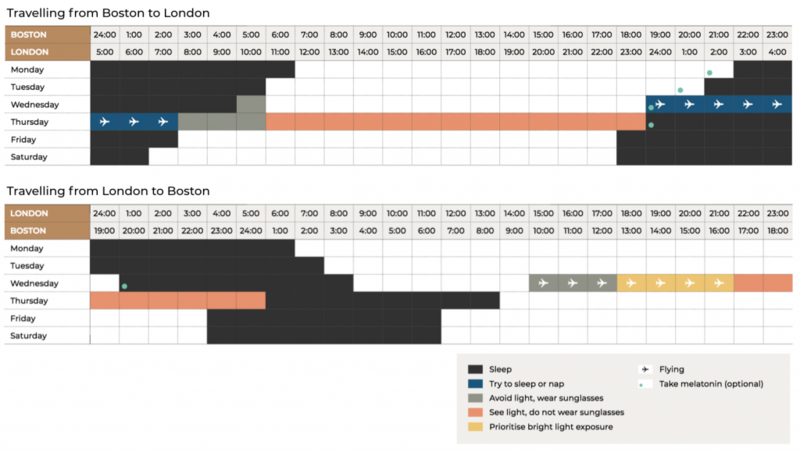 An example of a jet lag plan for Boston-London-Boston journey. Additionally, you should pay attention to your meal timing. Listen to your body with this. Just because the local time says it’s evening dinner time, your body may not feel ready for this. If you overeat and surprise your body with a big meal it may lead to digestive problems. Rather, choose lighter options. Likewise, if you wake up feeling hungry, enjoy a good breakfast and eat less later in the day. Remember too, that remaining well hydrated helps avoid constipation and helps the body to function well, and recover well. If you feel you cannot get through the day without going to bed, keep your nap short to ensure you are sufficiently tired at the end of the day. If you begin the night having slept for long periods during the day, you are unlikely to sleep well throughout the night. Using melatonin can help reset your body clock when dealing with changing times zones. Melatonin is a hormone that is naturally produced in your body when there is a lack of light, which then triggers the onset of sleepiness. Synthetic melatonin can help increase sleepiness and improve sleep, but only when you are not producing your own melatonin. By taking melatonin in the right quantity at the right time, you can effectively shift your body clock forwards or backwards, which can be very useful in speeding up adaptation to the new time zone. Precise advice from a jetlag expert is the best way forward. If you do want to try using melatonin, remember to check with your doctor first. Should you try to adapt or not? For those travelling to a new time zone for a short period of time, your trip may just be a few days long and the time zone just a few hours different. If this is the case, it may not be worth trying to adjust to the new local time. As much as possible, continue with your usual routine and keep your body clock on the former time zone in terms of eating and sleeping. If you decide to do this, you will also find that slotting back into your normal schedule on return will be easier. So, when you are planning and preparing for your next trip abroad which involves a change in time zone, don’t forget to refer to our key recommendations and consider the Timeshifter tool. There are positive steps you can take to help cope with the effects of jet lag. Think about what you can do before you go, during your journey, and on arrival at your destination that will help you not only survive, but to thrive!